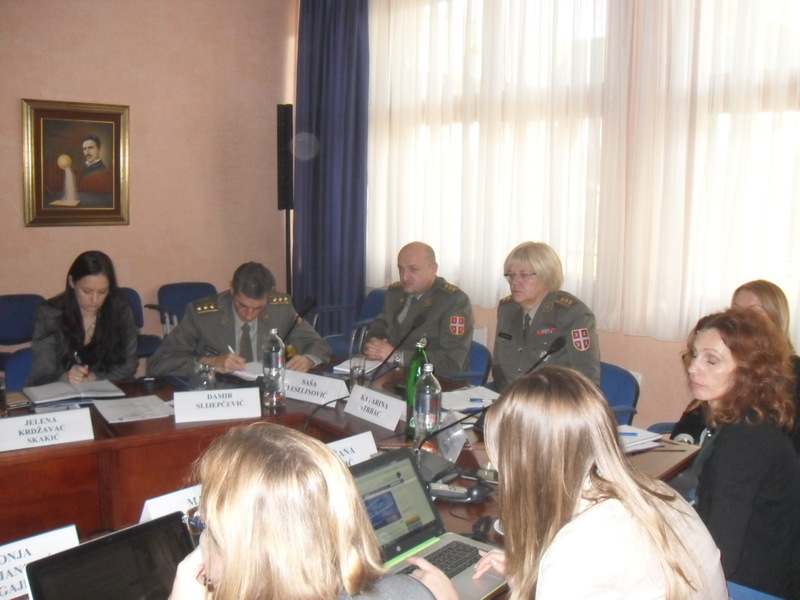 Officials of the Ministry of Defence and the Serbian Armed Forces, led by colonel Dr. Katarina Strbac, director of the Directorate of European Integration and Project Management of the Defence Policy Sector, attended the two-day seminar on civilian capacities in multilateral missions, which is a part of the project “Development of National Capacities of Serbia for Participation of Civilians in Peace- Support Missions”. The seminar, organized by International and Security Affairs Centre (ISAC fund) in Belgrade, took place on 24th and 25th November 2016 on Fruska Gora. Representatives of the Ministry of Foreign Affairs, the Ministry of Defence, the Serbian Armed Forces and the Cabinet of the Minister without portfolio responsible for European integration discussed issues related to the Chapter 31 of the negotiation process (Foreign, Security and Defence Policy) – building legal framework and strengthening capacity for participation of state officials in the EU civilian missions. Representatives of civil society organizations, the ISAC Fund and the Belgrade Security Policy Center, also contributed to this seminar. Representatives of the Ministry of Foreign Affairs of the Czech Republic, the Institute for Security Studies in Prague and the Centre for International Peace Operations (ZIF) in Berlin shared their valuable experiences and lessons learned regarding civilian contribution to peace-support operations and civil crisis management. Addressing the audience, colonel Dr. Katarina Strbac emphasized the importance of contribution which the Republic of Serbia provides to the preservation of peace in the world, including participation in multinational operations. This is corroborated by the fact that personnel of the Ministry of Defence and the Serbian Armed Forces, during the past year, participated in 11 multinational operations (seven of them were under the mandate of the United Nations and the rest were EU-led military operations). She also highlighted that participation of up to 720 members of the Serbian defense system in multinational operations is planned by the end of 2016. There is a clear tendency for further enlargement of our contribution in the following years, by sending civilian experts to the multinational operations of crisis management, supervision and guidance of democratic process, peace management and conflict resolution, post-conflict reconstruction, institution-building and ensuring lasting peace. Taking into account the lessons learned of so-called Czech and German models, presented during the seminar, it was concluded that the Ministry of Foreign Affairs of the Republic of Serbia as the project holder, with the technical assistance of the Ministry of Defence and other relevant institutions, will carry a responsible work ahead, primarily focused on providing a legal framework for sending civilians to multilateral missions. Therefore, the exchange of lessons learned through this seminar has been of great importance such practice should be continued.